Microsoft CEO Steve Ballmer: Bing! “Search and advertising, we are a small share….It’s all about Google. They have share, we don’t have share.” Microsoft CEO Steve Ballmer said that back in February, and according to the latest metrics from comScore (SCOR), it’s as true today as it was then. Google (GOOG) grew its share of the search market once again in April, and once again, Microsoft (MSFT) did not. The search sovereign’s share rose to 64.2 percent in April from 63.7 percent in March and 61.6 percent from a year ago, according to new data from comScore. Its April query volume grew 45.5 percent, the fastest growth rate since October 2007. Meanwhile, Microsoft’s market share for the month topped out at 8.2 percent, down from 8.3 percent in March and 9.1 percent a year ago. They have share, we don’t have share. Truer words. How much longer will Ballmer have to utter them? We may find out today when he debuts Microsoft’s newest search offering from the D7 stage. So how does this affect your business? Ballmer says Microsoft (MSFT) is doing a lot of soul-searching and flattening out its business and cost base. “We’re shaking up the future product investment stream.” That said, he notes that the company continues to invest aggressively in R&D. “We’re investing in areas where there’s room for improvement.” Interesting euphemism. Ha. Walt convinces Ballmer to refer to Google (GOOG) as Google, rather than “the market leader” as he has in years past. “Goo… Google,” he says. It’s a “Star Trek” parody– “Search: the final frontier. To boldly go where someone had gone before.” “A bold search for a new name.” Video runs over Microsoft’s chronic renaming of its search engine. Was securing the trademark problematic? Ballmer says there were a few challenges. Bing Crosby, apparently, was not an issue. In any case, Ballmer seems to enjoy saying the word of his new search service. Maybe Microsoft should consider a new name for Zune. “Zing”? 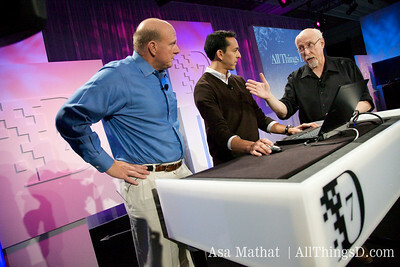 Ballmer brings out Yusuf Mehdi to demo Bing. It’s going live on June 3. From a UI perspective, it’s a box and a button format with screensaver-esque background. Demoing basic Web searches. Best Match denotes an official or definitive site–the site we know to be authoritative. Instant Answer–answers to obvious questions delivered along with search returns; a search for Oscars immediately returns a result for who won an Academy Award. A search for UPS (UPS) automatically returns a customer service number at the top of the page. Walt asks to search on “Microsoft.” Much laughter, but the search return does feature a customer service number. Demoing media searches now. Video searches pull up a nice screen of thumbnails that play in the search pane when clicked. On to weather. Bing gives a full five-day forecast, as opposed to what Google offers–a single day, I think. Search for a city returns, weather, events, sports games, video mentions of the area. On to shopping. A search for a Canon (CAJ) camera returns a hybrid search shopping page. Price comparisons, user reviews. Also, Cashback, which rewards people for purchases made through the site. Here’s a nice feature: Farecast. Flight search–issues a query across airlines by price, hops, etc. Also tracks flight pricing trends. Tells you if your fare is likely to go up. Recalling Ask’s big redesign and it’s subsequent rise and fall, Walt asks if the same thing might happen to Bing. “No,” says Ballmer. Bing is too tremendous a stride. It differentiates itself from Google. It might not appeal to everyone, but if it appeals to 20 percent of them, that’s a success. Ask wasn’t able to do that. Walt asks Ballmer about the overhaul of Windows and how important it is in an era when we’re moving to cloud-based services and from PCs to netbooks and mobile devices. Ballmer seems puzzled by the question. Smartphones are PCs. Netbooks are PCS. “The Web is designed for the PC….Most of these mobile apps are substituting for the fact that the original app wasn’t designed for the PC,” he says. On to the Q&A. First question: How is Microsoft going to convince users to learn the new Windows 7 and Office UI? 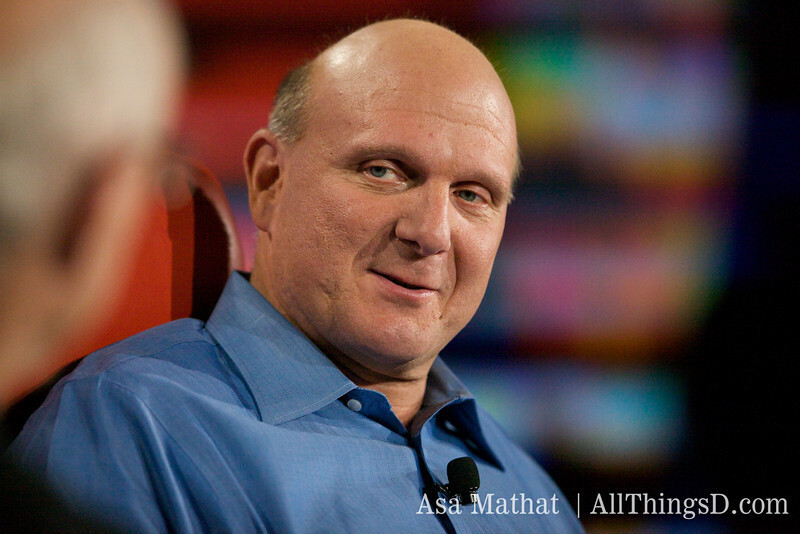 Ballmer says change is difficult. Notes that he hates whenever The Wall Street Journal changes its format. He says Microsoft’s internal testing has determined that the changes the company has made to the OS and Office suite are good ones that will be embraced. That said, there will always be some difficulties. Questioner asks about natural-language search, wondering how Bing would deal with a search for a Hilton hotel in Paris, when there’s the possibility that it might return a list of results for Paris Hilton. He asks for a demo, but Ballmer declines. He can try it for himself on June 3. Question about Microsoft’s efforts in the medical arena. Ballmer: “Health’s a tough business. People who make IT decisions in the medical industry don’t make them quickly.” That said, Microsoft is “full speed ahead” in the area. How is Microsoft differentiating sponsored searches in Bing? Cashback is obviously differentiated, Ballmer says. Paid side is tougher though. A note about our coverage: This liveblog is not an official transcript of the conversation that occurred onstage. Rather, it is a compilation of quotes, paraphrased statements and ad-lib observations written and posted to the Web as quickly as we were able. It was not intended as a transcript and should not be interpreted as one. Steve Ballmer, CEO of Microsoft. The current system is kludgy. People want it seamless.